Vanryth Gatharian is a Dunmer blacksmith who establishes a weapon store in front of the Ragged Flagon in Riften's Ratway once you have improved the Thieves Guild. He sells enchanted weapons as well as armor and the materials to make them. His store is filled with shelves of armor, boots and gauntlets. If you buy enough items from him, he will allow you take some items from his store. 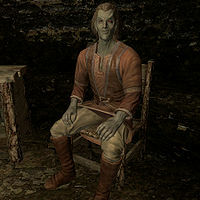 It is hinted that he is the same Vanryth who taught Glover Mallory how to repair and smith bonemold, as his name, his occupation and association with the Thieves Guild are a possible match to Glover's story. Vanryth spends all day and night serving his store while seated on a chair. The only time he will not offer you his services is if you have offended the Thieves Guild and will continue not to until you complete the Reparations quest. Vanryth wears a set of merchant's clothes along with a pair of boots. He carries a leveled sword which can be up to elven in quality along with a small amount of gold. Dedicated to his store, Vanryth will be quite eager to offer you his services. He may greet you with, "Looking to fix your armor?" He will then elaborate on this subject: "Be glad to repair any damage to your Guild armor." He will also happily offer you some new gear: "Can I interest you in anything? Some fine armor perhaps?" When you have upset the Thieves Guild, he will not want your business and will quickly state, "Come back when you're in the Guild's good graces." This is the merchandise found in Vanryth's merchant chest. These items are only available if purchased from the merchant; they cannot be pickpocketed or stolen. They are restocked every two days. This page was last modified on 3 July 2014, at 16:09.